what happens in Vegas...may get blogged about. No kids, I have not forgotten. I realize it’s been a while but I’m just starting to shake off that 3-week-long hangover, and you’d be surprised at how time-consuming it is to get a marriage annulled. Just kidding…maybe. And I couldn’t figure out where the incriminating pictures from that weekend went. Until I remembered they were viewed once and then deleted. 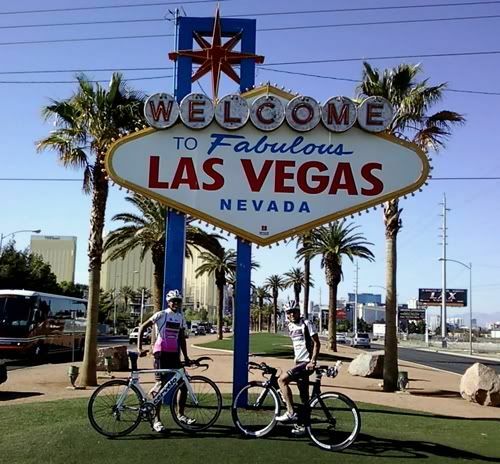 There are some “safe to post” photos on my cell phone camera so I will get those up on the next blog along with some shenanigans me and Scottie got into in Sin City! Also in a blog coming soon–my exciting new summer plans which do not include Switzerland. In the meantime I have to prep for my first track marathon at home tomorrow morning. 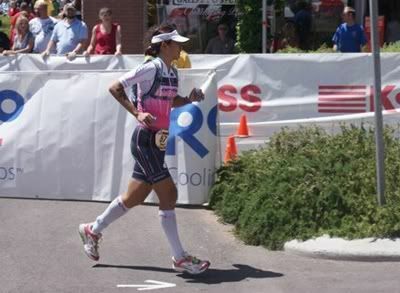 Just another day in the life of a triathlon superstar! I used to like cold water. This one time, when I lived in Atlanta, I won a New Year’s Day polar bear swim. The water was 45*F and of course we didn’t wear wetsuits. I stayed in the longest. I used to prefer swimming in colder water. Then again, I also used to have at least 15 more pounds of fat on me and thus a thicker layer of insulation. And didn’t train for 2.5 months in Thailand where the swimming pool temperature regular exceeded the air temperature, the air being 95*F or hotter. I should’ve known something was amiss when I went home and the pool I usually considered uncomfortable warm (at 84*F) felt chilly. I tried to load up on ice cream and get some insulation back during race week, but it was too late. What was also too late was how late I finally got into the water at Sand Hollow Reservoir on race morning. I made some rookie mistakes, waiting too long in the porta-potty lines before finally asking if I could please cut in front–I am a very important pro person and have to be in the water REALLY SOON!! Then running all the way to the other side of transition to drop off the “morning clothes” bag instead of just handing it to a nice volunteer by the swim start. Well, I am still a rookie pro and learning these little tricks now. As usual I was very happy to get out and realized that from my frozen calves down it was hard to stand and run. A 1:17 swim, not fantastic at all. The hardest part about swimming so slow isn’t the time deficit from the leaders, but to mentally shake it off and not let it affect the next 9+ hours of your day… Easier said than done. 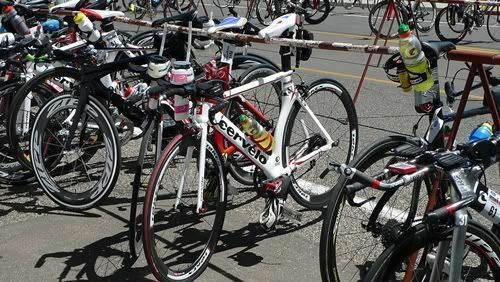 It took me over 8 minutes in transition and then some time on my bike, maybe the entire bike to shake it off. I wish I could tell you I was taking a hot shower and drinking hot chocolate while I was in the transition tent because you can sure do a lot in 8 minutes, like run a mile. Heck, run a beer mile. 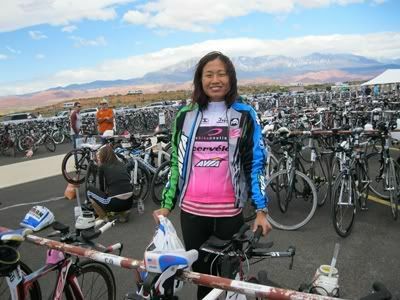 I remember sneezing no less than 4 times and changing into some dry clothes, getting on arm warmers and a vest and socks, and wondering why my fingers weren’t working even though I had 2 volunteers helping me get dressed. Then again those 8 agonizing minutes I was fighting for a reason to keep going. My brain and body felt frozen; an icicle had pierced my spirit and motivation. You swim a 1:17 and there’s a good chance you won’t finish within 8% of the winner…you know, that prize money cut-off. I was wondering the same thing the online cynics would soon say…”why is she even a pro?” But Coach said from the beginning not to think about prize money until you can get your swim under an hour. And anything can happen. HTFU and get on your bike! The bike was a hilly course, not mountainous like Embrunman, but I was well aware it might take me up to 6 hours to ride the course. (The EmbrunMan bike course was at least 5 miles longer and took me almost 7.5 hours.) I had a little mechanical trouble with my cassette skipping a bit when I was in the small chainring, so I ended up bike monstering, i.e. climbing more in the big gear, than I intended to. The new Token race wheels were pretty slick though and I really flew down the hills. The nice thing about a hilly race is that half of it is downhill, right? 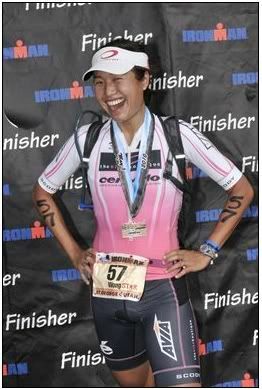 I had some fellow competitors I biked by on the downhills ask after the race how I went down so fast…wasn’t I scared? Well, not on straight downhills (technical twisty roads are a different story), and I just don’t look at my bike computer at how fast I’m going. Better not to know I also think it is key to be really comfortable on your bike–me and White Tiger, my Cervelo P3, are like two peas in a pod. Or a pea in a pod. Or something like that. White Tiger hanging out after 6 hours of hard work! As far as I knew, I had only passed one pro woman during the bike. There were 19 on the start list, so I figured I was 18th at the worst, maybe 15th if a few hadn’t shown up. UGH. 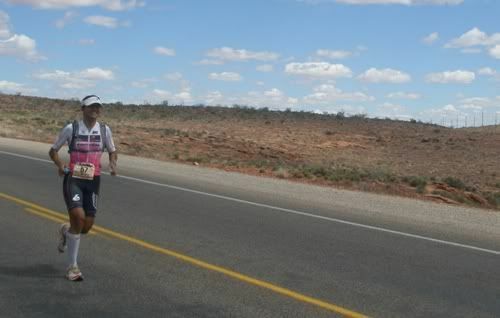 But when all else fails, it’s still a triathlon with one event left to go–the marathon. I’d been running really well at training camp and I do love me a good hilly run course. As Coach always says, “Ironman is not about fast, Ironman is about STRONG.” I’ve got strong legs (which will someday become BIKE MONSTER LEGS) and can hammer downhills like no tomorrow; uphills I don’t seem to notice as much as others. The run course at St. George was the hilliest marathon I’d ever done–straight up or down the whole way, nothing flat at all. When I put on my running shoes, I was able to finally clear my head of the previous two events and started focusing on running a great marathon. Somewhere inside me I still held onto the hope that I could run down some girls. The first four miles I was counting the pro women coming the opposite way (the course is two loops out-and-back) but got discouraged when I realized that 6th and 7th (Kate and Miranda) were at least 5 miles in front of me. After I counted 11 pro women that were still in front of me, I stopped counting. Top ten was probably out of reach and I didn’t want to get further discouraged. So I stopped thinking about what place I was in and just focused on myself. I liked how the course was laid out, and the fact that I got to see my sister, Dave, homestay Jenifer and her family at the mile 4 aid station right about halfway on the course. So every 3 to 4 miles I always had something to look forward to: the beginning of the course (start, finish, and halfway point), the middle of the course (my favorite aid station and favorite cheerleaders), and the end of the course (the turnaround). My sister was handing out sponges, which I found really funny because it wasn’t hot at all. I only ever took a sponge from her, because I felt obligated to. I was very happy with how I ran this marathon; I really pushed myself the entire way and made myself hurt more than I ever have. Scottie told me he was laughing at me during the race because for once I was not very smiley and he was. The course was no joke, but half of it was downhill. Including the last 3 miles going into the finish, which I ticked off at sub-7 pace. I was even running with pro guy #8 on my first lap (he was on his 2nd lap, obviously). 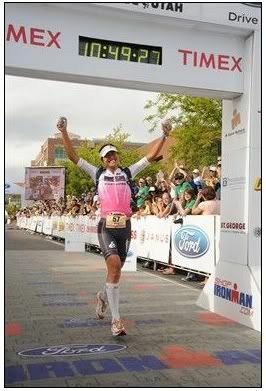 When I got to the finish chute, I was ecstatic. I didn’t know what place I was in, but felt happy with my performance. I remember Cam Watt had told me last year, that the thing about having the run as the last event is that you can have a bad swim and bad bike, but if you run great, you feel you had a great race. 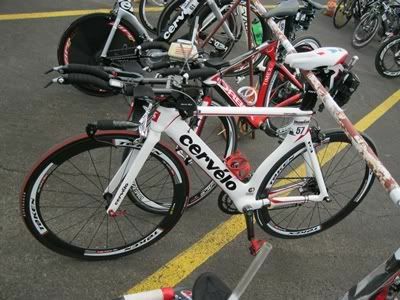 But if you have a great swim and great bike, then run like crap, you feel like it was a bad race. As usual, I didn’t know what place I got until I was on the phone with Mom & Dad, who were tracking me online. 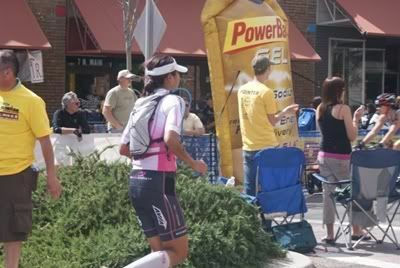 Somehow I ended up in 8th place for the pro division…so somewhere along the way I passed other pro women without noticing. 8th pro is my best finish on a race on home soil, so I’m very proud of that despite the slow finishing time. As for why this race report has taken so long, I guess I’ve done a lot of thinking and re-evaluating about how this race went for me. At first I thought I did terrible, then I wasn’t sure, then I was confused, but in the end I am happy with it. Not satisfied, but happy with it, because it is progress and I have learned from it and grown stronger from it. I’ve never been “All-American” in the USA Triathlon Rankings (I think it’s the top 5% of the age group each year). I would have probably gotten it last year if I did one more race as an amateur, but I was tired of paying for entry fees and the goal was never to become a great age grouper. So I took the pro license and crossed that imaginary line to see if I would have what it takes to make it as a professional triathlete, knowing that it will take years to improve and become a champion, not weeks or months. Yes, I realize that 3 age group women finished in front of me, time-wise. Of course there is the argument that it is a different race, and they didn’t have to swim all by themselves, but even without that, I have come to realize…this is a step of my athletic career that I have to go through. Like I said, I have never been one of the fastest age groupers, and you don’t just skip from becoming a mediocre age grouper to suddenly getting podiums in the pro field. Coach has always talked about how it is like building a house. You start from the foundation and build one floor at a time. You can’t skip a floor or the whole house comes crashing down. Because I don’t want to go back to being an age grouper. I have no regrets going this route and despite how tough it is, I am having the best time of my life chasing this dream. I will take my chances here in the pro ranks, going up against the big girls, fighting my way to the top, slowly…but surely. I might be swimming terribly now, and getting beat by a couple amateurs here and there, and not making the prize money cut-offs, but day by day, race by race, I continue to improve. 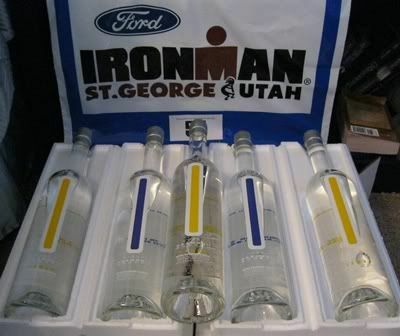 Ironman St. George was another step up the ladder, and so, I am happy with it. How to become an international triathlon superstar, step #9: Remember who you are, and remember where you came from. Stay grounded on the path to superstardom. Thank you to all my sponsors for helping me to pursue my dream, especially while I am not yet fast enough to be making any prize money this year: teamTBB and the Bike Boutique, Cervelo, AVIA, Mark Cathcart and Haamonii Smooth Shochu. 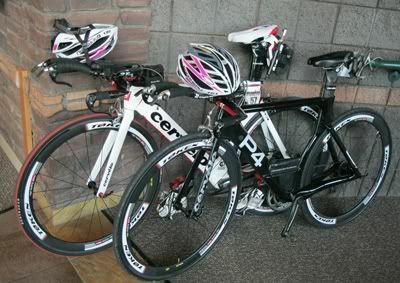 Thanks to our gear suppliers: BlueSeventy wetsuits, Token Wheels, ISM Saddles, Louis Garneau & 3T. 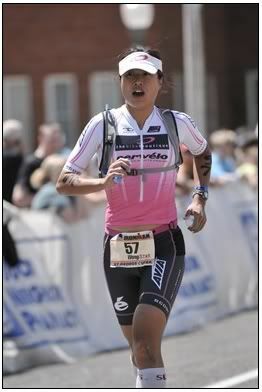 Special thanks to Camelbak as well for sending me a new one just in time for the race! 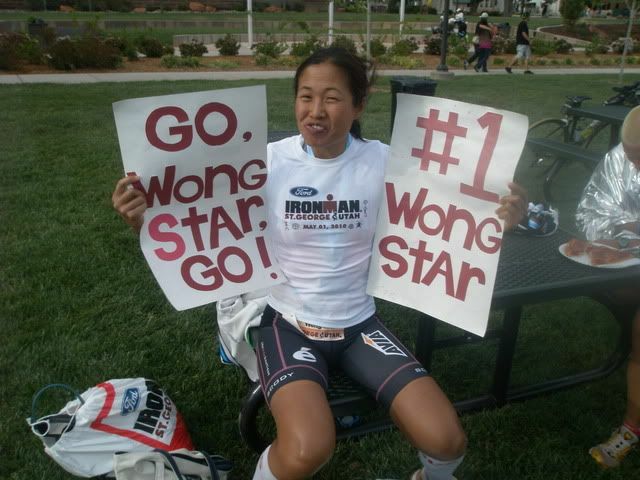 Thank you to my family, especially Mom and Dad Wongstar for their support at home when I’m not at training camp, and my sister (the WongSiSTAR!!) for coming to see me race Ironman for the first time! And a really huge thanks to my homestay, Jenifer Harris in St. George!! Thank you for EVERYTHING and incorporating me as part of the family for an entire week. It was my first time staying at a homestay and you truly made me feel like…I was at home. 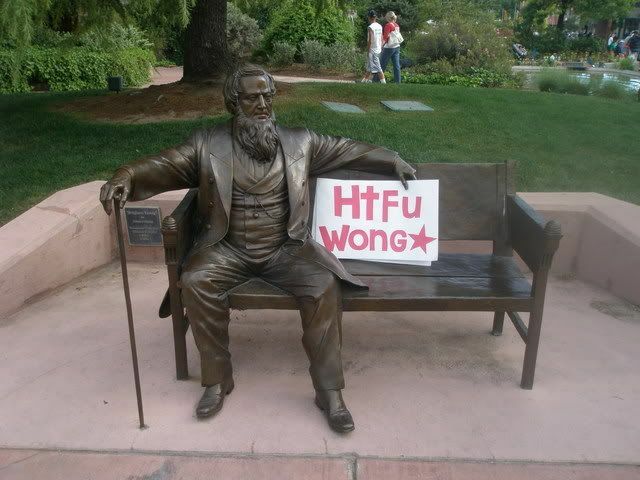 Guess that’s why they call it a homestay. who will you cheer for tomorrow? #57 of course! 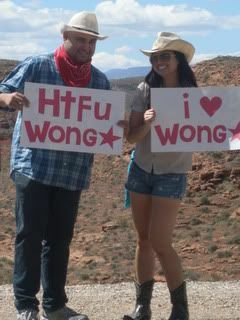 The St. George adventures of the Wongstar and White Tiger continue today, our last day before the race. Scottie and I got in our last swim at the Sand Hollow Aquatic Center, a really awesome public pool only a 20-minute bike from my homestay (30mins from Scottie’s). We decided that swimming in 81*F (27*C) was much nicer than swimming in 54*F (12*C), which is the temperature of Sand Hollow Reservoir (20 miles out of town), where the swim will take place tomorrow morning. Then it was off to tiger check-in. Bike check-in, whatever. It was super blustery down by the start; they call it Hurricane Valley because there is no shelter from the wind. You have to admit that White Tiger looks extra handsome with his new Token race wheels! Rawr! Then I got back to the homestay and special delivery for the Wongstar! Oh boy…the most Haamonii Smooth Shochu I’ve ever had for a race. Excellent motivation to really kill it tomorrow. Let’s hope this is enough to roll into our post-race trip to Vegas too! If we run out before then, it’ll be because I won the whole damn race! That’s it for now. 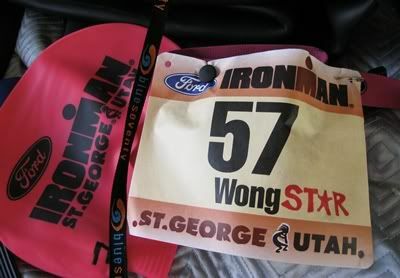 You know the usual…you can track me online at www.ironman.com, our start time tomorrow is 6:50am Utah time, which is 5:50am California time for my family back home. My big sister is coming to watch me do an Ironman for the first time ever (!!!) which we are both really excited about. 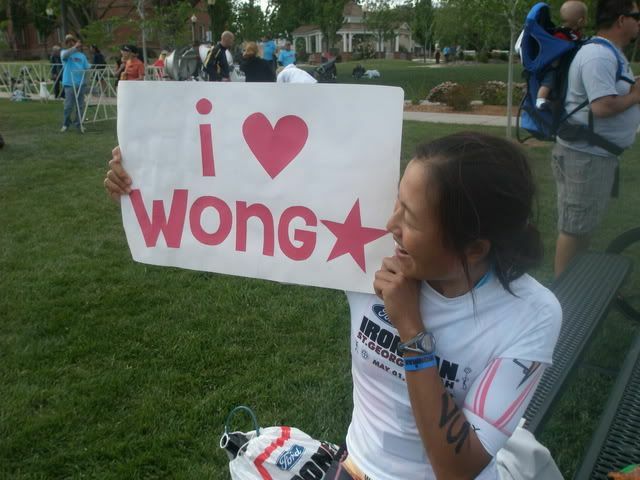 She will try to put up some Twitter updates on my Twitter @theWongstar but probably just during the marathon. She sent this image to my phone while I was sleeping last night. Oh boy! My sister is the one that got me into running when we were younger. I hated running but wanted to be just like her, since she was my childhood hero. Looking forward to making everyone proud tomorrow!! You are currently browsing the Jocelyn Wong's Blog blog archives for May, 2010.